A would-be thief was caught by police with cloned number plates, balaclavas and crowbar in his uninsured van. 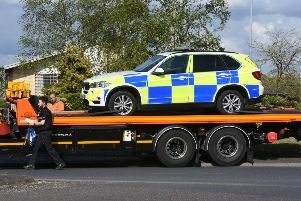 Police were driving along the A141 towards Warboys on 18 June last year when they stopped Darren Hipgrave, 49, in a black Saab in a layby between Warboys and Oldhurst. A search of the van found a crowbar, bolt croppers, three number plates, three balaclavas and gloves. When asked why he had three balaclavas Hipgrave said he got cold in winter. Police also found a ‘jiggle key’, a type of skeleton key used to access Ford vehicles, which Hipgrave claimed he’d bought on eBay after he lost his original key. He was also found to be driving on cloned number plates. Hipgrave claimed he had cleared his shed out and the three cloned plates were from cars he used to own but officers found the plates matched those of three legitimate plates on other vehicles. On Wednesday (10 April) at Cambridge Crown Court, Hipgrave, of Meppershall, Bedfordshire, was sentenced to 18 months, suspended for two years. He had pleaded guilty to going equipped to steal, driving a vehicle with no insurance, driving a vehicle with no licence, possession of an article for use of fraud, possession of an offensive weapon in a public place and fraudulent use of a registration mark. Detective Constable John Whitworth said: “The items we found in Hipgrave’s vehicle suggest that he may have been considering breaking into houses or vehicles, and that he had taken precautions to avoid getting caught if he had done so.